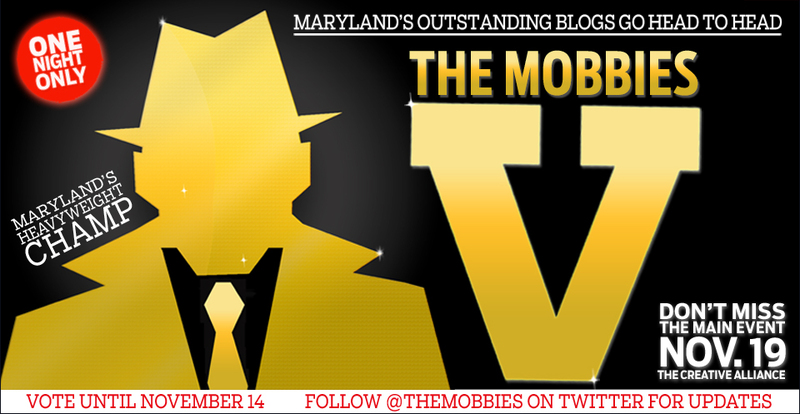 The Baltimore Sun’s Mobbie Awards (Maryland Outstanding Blog Awards) is tonight! It’s the 5th annual one, so it’s kind of a landmark event. I can’t believe it’s been a whole year since this blog, yes this blog in front of your internet strained eyes, won the title for Best New Blog. I also came in second for Best Photo Blog and third for Best Instagram Account (lol, why?). I wasn’t eligible to run this year because of my internship with the Baltimore Sun, conflict of interest and all, so I will simply be a spectator. The Mobbies turn five this year! To celebrate, join us as we award championship belts in our Outstanding Blogs competition.Mix and mingle with young upstart bloggers, veteran tweeters and their entourages at a happy hour held at Creative Alliance. Food will be provided by RA Sushi. During the awards ceremony, we’ll announce the winners of each blogging category, as well as a readers’ choice and an editors’ choice. We’ve got a few more surprises in store, so come prepared for a night of fun!This is an open party, and all are welcome. PARKING: The Creative Alliance does do not have its own lot, but recommends parking toward or alongside Patterson Park. I didn’t go through and pick every category. I have zero interest in sports, so I doubt I’m a fair judge for that one. For my followers on here, I definitely recommend you check out the Cadillac Ranch Dressing for Best Photo Blog one because it’s another blog all about FILM, which is what WE LIKE. And let’s just say, that Tumbleweavicus Baltimoricus for Best New Blog, come on, what a gem! We’ve all seen those tumble weaves. My favorite was that curly black one I ran over on York Road for three straight weeks until it eventually went to hair heaven. *When I think of who should be a winner I think that it all depends on how original the content on the blog is and how unique of a perspective it gives to the reader, time doesn’t matter but aesthetics do. I only had this blog for three months before I won Best New Blog and yes, I did get some criticism (How did you win for 2013 when you only had it for three months? Blah blah blah), but at the same time this IS a popularity contest. In the short time I had this blog before I won I had a lot of content on it and a good amount of followers as well as a lot of positive feedback. It’s people voted, no judges, so the readers and other bloggers choose the winners. You can work as hard as you want on a blog but if it’s not original content or something that has been done time and time again in the same way people are used to seeing it then it doesn’t have a good shot. Being fresh is what matters these days! It’s hard and sometimes I struggle with it but there’s always something new to talk about, you just have to find it. PS. Speaking of voter driven contests and judges….I made a video response for you guys ages ago and it never uploaded correctly until now for some reason. I posted a few weeks ago asking you to vote for me for photographer of the year for the RAW Awards, I didn’t pass the judges round but had a good time anyways! Here’s some new info….. If you find me boring or my voice annoying, here’s the news: I didn’t win but I was chosen as the Director’s Highlight! I’ll be showing at TATU on December 5th. If you’d like to purchase tickets please go here —-> www.rawartists.org/kaitlinnewman and click “BUY A TICKET FOR THIS ARTIST”. We have a Nomination for A MOBBIE AWARD. Vote here!